The Cleveland Indians played weekend and holiday games at Cleveland Stadium from 1936 to 1946. 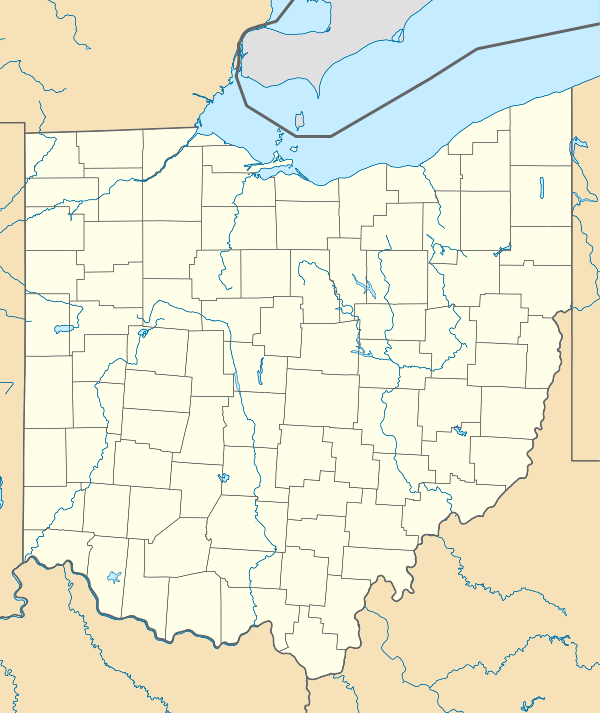 Cleveland Stadium, commonly known as Cleveland Municipal Stadium, Municipal Stadium, or Lakefront Stadium, was a multi-purpose stadium located in Cleveland, Ohio. It was one of the early multi-purpose stadiums, built to accommodate both baseball and football. The stadium opened in 1931 and is best known as the long-time home of the Cleveland Indians of Major League Baseball, from 1932 to 1993, and the Cleveland Browns of the National Football League (NFL), from 1946 to 1995, in addition to hosting other teams, sports, and being a regular concert venue. The stadium was a four-time host of the Major League Baseball All-Star Game, one of the host venues of the 1948 and 1954 World Series, and the site of the original Dawg Pound, Red Right 88, and The Drive. Former Browns owner Art Modell took over control of the stadium from the city in the 1970s and while his organization made improvements to the facility, it continued to decline. 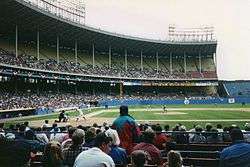 The Indians played their final game at the stadium in October 1993 and moved to Progressive Field the following season. Although plans were announced to renovate the stadium for use by the Browns, in 1995 Modell announced his intentions to move the team to Baltimore citing the state of Cleveland Stadium as a major factor. The Browns played their final game at the stadium in December 1995. As part of an agreement between Modell, the city of Cleveland, and the NFL, the Browns were officially deactivated for three seasons and the city was required to construct a new stadium on the Cleveland Stadium site. Cleveland Stadium was demolished in 1996 to make way for FirstEnergy Stadium, which opened in 1999. Much of the debris from the demolition was placed in Lake Erie to create an artificial reef. Built during the administrations of city managers William R. Hopkins and Daniel E. Morgan, it was designed by the architectural firms of Walker and Weeks and by Osborn Engineering Company. It featured an early use of structural aluminum. The stadium was dedicated on July 1, 1931. On July 3, 1931, it hosted a boxing match for the National Boxing Association World Heavyweight Championship between Max Schmeling and Young Stribling, with 37,000 fans in attendance. Schmeling retained his title by a technical knockout (t.k.o)-victory in the 15th round. The stadium was built for football as well as for the Cleveland Indians, who played their first game there on July 31, 1932, losing to the Philadelphia Athletics' great pitcher Lefty Grove 1-0 while attracting a then-major-league-record crowd of 80,184. The Indians played all of their games at the stadium from the middle of the 1932 season through 1933. However, the players and fans complained about the huge outfield, which reduced the number of home runs. Moreover, as the Great Depression worsened, attendance plummeted. In 1934 the Indians moved most of their games back to their smaller previous home, League Park. In 1936, the Indians began playing Sunday and holiday games at Cleveland Municipal Stadium during the summer. Beginning in 1938, they also played selected important games there. Starting in 1939, they played night games there as well because League Park did not have lights. By 1940, the Indians played most of their home slate at the stadium, abandoning League Park entirely after the 1946 season. They played there until the end of the 1993 season, after which they moved to Jacobs Field. The stadium anticipated problems that would emerge 40 years later when cookie-cutter stadiums were in vogue. Due to the fundamentally different sizes and shapes of baseball and football fields, the baseball sight lines generally left much to be desired. The original baseball playing field was so large that an inner fence was constructed in 1947 to cut down the size of the spacious outfield. Even after it was put in, the distance markers on the bleacher walls remained visible for many years; it was 470 feet from home plate to the bleachers in straightaway center field. No player ever hit a home run into the center field bleachers. According to his own autobiography, Veeck – As in Wreck, Indians owner Bill Veeck would move the fence in or out, varying by as much as 15 feet, depending on how it would favor the Indians, a practice that ended when the American League specifically legislated against moving fences during the course of a given season. The Indians set three Major League attendance records during the 1948 season, when they won the American League pennant and World Series behind pitcher Bob Feller and shortstop/player-manager Lou Boudreau. That season, Cleveland had the highest single season attendance, 2,620,627, which was not eclipsed until 1962 by the Los Angeles Dodgers, largest regular season night game attendance of 72,434 for the first major league start of Satchel Paige, and biggest World Series game attendance of 86,288 for game 5 on October 10, 1948. However, during the Indians' lean years from the 1960s through the 1990s, they rarely attracted more than 30,000 people, and even crowds of 40,000 looked sparse in the cavernous environment. After the Indians were eliminated from the pennant race in 1949, as a black humor-themed promotion they held a mock funeral procession on the field and buried their 1948 pennant behind the center field fence. On four separate occasions, it hosted the All-Star Game: 1935, 1954, 1963, and 1981. The 1981 All-Star Game was notable for two reasons: it was the first game after the conclusion of the 1981 Major League Baseball strike, and it was held the day after a Cleveland Browns exhibition football game. Later that season, On May 15, it was the site of Len Barker's perfect game. On its last day as home of the Indians on October 3, 1993, the team's fans, led by comedian Bob Hope, who grew up an Indians fan and was once a part-owner, sang a version of his signature song "Thanks for the Memory" with special lyrics for the occasion. The Indians lost to the Chicago White Sox 4–0 in the stadium's final baseball game, with 72,390 fans in attendance. The first Browns game at the stadium was also the first AAFC game, when the Browns hosted the Miami Seahawks on September 6, 1946. The Browns won the game 44–0 and drew 60,135 fans, what was then a record for a professional football crowd. During the 1980s, the center field bleachers at the east end of the stadium were home to many of the club's most avid fans and became known as the Dawg Pound after the barks that fans made to disrupt opposing teams' offensive plays. The fans were copying Browns players Hanford Dixon and Frank Minnifield, who frequently appeared to bark to each other and to the opposition. Some of the fans even wore dog masks and threw dog biscuits at opposing players. The Dawg Pound was included in the design of FirstEnergy Stadium, where the east end zone is also bleacher seating. August 21, 1986 – Boston's Spike Owen tied a Major League record by scoring six runs. January 11, 1987 – The Drive: In one of Cleveland's many sports disappointments, John Elway leads the Denver Broncos 98 yards down the field for the tying score late in the AFC Championship Game. Denver wins in overtime, 23-20, earning the right to play in Super Bowl XXI. December 3, 1996 - Cleveland Stadium Catches on fire during demolition. March 1, 1997 - Demolition Ends. Local college teams, including Western Reserve Red Cats, Case Tech Rough Riders, John Carroll Blue Streaks, and Baldwin Wallace Yellow Jackets used the stadium as well, especially during the 1930s and 1940s when the city Big Four Conference was strong. Of the 60 all-time Big Four matchups, 22 were played at Cleveland Stadium, the most of any venue. The Illinois Fighting Illini played the Penn State Nittany Lions there in 1959. The Ohio State Buckeyes played in the stadium four times. The first was in a 1942 win over Illinois before 68,656, the second a 1943 loss to Purdue, and the third a 1944 victory over Illinois. The final college football contest played there was on October 19, 1991, when the Northwestern Wildcats played a "home" game against the Buckeyes. While Northwestern received the home team's share of the gate receipts, the crowd was mostly Ohio State fans. Several scenes for the motion picture, The Fortune Cookie, were filmed during the game between the Browns and the visiting Minnesota Vikings on October 31, 1965. Much of the 1949 movie The Kid from Cleveland, in which Bob Feller, Lou Boudreau, Bill Veeck and Satchel Paige played themselves, was filmed there. Despite being set in the stadium, the 1989 motion picture Major League was not filmed in the stadium. While aerial distance shots of the stadium were used, Milwaukee County Stadium, whose grandstand interior looked similar to that of Municipal Stadium, was used for filming. Some scenes in the 1991 made-for-TV Babe Ruth biopic, starring Stephen Lang as Ruth and with a cameo by Pete Rose as Ty Cobb, were filmed there. Modell, mistakenly believing that his revenues were not endangered, refused to participate in the Gateway Project that built Progressive Field for the Indians and Quicken Loans Arena for the Cavaliers. Modell's assumptions proved incorrect, and Stadium Corp.'s suite revenues declined sharply when the Indians moved from the stadium to Jacobs Field in 1994. The following year, Modell announced plans to move the Browns to Baltimore after the 1995 season. Modell's move of the Browns breached the team's lease, and the City of Cleveland sued. As part of the settlement, the city agreed to demolish Cleveland Stadium and build a new stadium on the same site. Modell agreed to leave the Browns' name, colors, and history in Cleveland, and the NFL agreed to have a resurrected Browns team by 1999, either by relocation or expansion. The new team, when it came into existence, was actually an expansion team. Demolition on Cleveland Stadium began in November 1996 and was completed in early 1997. 15,000 short tons (14,000 t) of demolition debris was dumped into Lake Erie to create three artificial reefs for fishermen and divers, offshore of Cleveland and neighboring Lakewood. Construction on Cleveland Browns Stadium began later in 1997 and it opened in 1999. ↑ "History, Legacy...and Today". Biltmore Construction. Retrieved May 10, 2014. ↑ Lewis, Franklin (2006). The Cleveland Indians. Kent State University Press reprint from Putnam. pp. 166–167. ISBN 978-0-87338-885-6. ↑ Browne, F.G., ed. (1933). The Games of the Xth Olympiad, Los Angeles 1932 Official Report (PDF). Los Angeles, California: Xth Olympiad Committee of the Games of Los Angeles, U.S.A. 1932, Ltd. pp. 37–38. OCLC 1437448. Retrieved January 5, 2016. ↑ Pahigaian, Josh; O'Connell, Kevin (2004). The Ultimate Baseball Road Trip. Guilford, Connecticut: Lyons Press. p. 235. ISBN 1-59228-159-1. ↑ Torry, Jack (1996). Endless Summers: The Fall and Rise of the Cleveland Indians. Diamond Communications. p. 207. ISBN 0912083980. A peculiar legend has emerged that Cleveland Stadium was a WPA project designed to attract the Olympics. ↑ Cormack, George (1997). Municipal Stadium: Memories on the Lakefront, Vol. 1. Cleveland, Ohio: Instant Concepts, Inc. p. 2. ISBN 1-882171-21-7. ↑ "Donald Gray Gardens". Cleveland Historical. Retrieved April 22, 2012. ↑ Sanchez, Joseph (February 16, 1992). "Pulling His Own Strings Henshaw Carries Top Credentials". The Denver Post. p. 15B. Retrieved May 10, 2014. ↑ Toman, James A. (1997). Cleveland Stadium: The Last Chapter. Cleveland, Ohio: Cleveland Landmarks Press, Inc. p. 87. ISBN 0-936760-10-9. ↑ "1993 Cleveland Indians Schedule and Results". Baseball-Reference.com. 2016. Retrieved October 31, 2016. ↑ Exner, Rich (December 17, 2009). "This Day in Browns History: Original Browns win farewell game in Cleveland Stadium". The Plain Dealer. Retrieved January 15, 2016. ↑ "1931 Cleveland Indians". Pro Football Reference. Retrieved May 27, 2015. ↑ "Brooklyn Dodgers 0 at Cleveland Indians 6". Pro Football Reference. Retrieved May 27, 2015. ↑ "Chicago Cardinals 14 at Cleveland Indians 6". Pro Football Reference. Retrieved May 27, 2015. ↑ Fox, John L. (September 1993). I Pitched Opening Game at Cleveland Municipal Stadium. Baseball Digest. p. 82. Retrieved July 19, 2010. ↑ Watterson, John S. (2000). College Football: History, Spectacle, Controversy. Baltimore: Johns Hopkins University Press. p. 256. ISBN 0-8018-6428-3. ↑ Krsolovic & Fritz. "League Park, Historic Home of Cleveland Baseball 1891–1946", McFarland & Co., 2013, pp. 33-34. ↑ Toman, James A. (1994). Cleveland Stadium: Sixty Years of Memories. Cleveland, Ohio: Cleveland Landmarks Press, Inc. pp. 45–46. ISBN 0-936760-09-5. ↑ Creamer, Robert W. (September 30, 1991). "The Babe Goes Hollywood". Sports Illustrated. Retrieved May 10, 2014. 1 2 Munson, Lester (December 4, 1995). "A Busted Play". Sports Illustrated. Retrieved May 19, 2011. ↑ Morgan, Jon (December 17, 1995). "Inside the Browns Deal". The Baltimore Sun. Retrieved July 1, 2008. ↑ Naymik, Mark (September 13, 2012). "Art Modell Was Offered a Stadium for the Cleveland Browns and Passed". The Plain Dealer. Cleveland. Retrieved October 3, 2012. ↑ Ohio Coastal Atlas (PDF). Ohio Department of Natural Resources. p. 10. Retrieved October 4, 2016. ↑ Wendling, Mike (August 19, 1999). "Stadium finds new life as a lake reef". Cincinnati Enquirer. Associated Press. Retrieved October 4, 2016.